UPDATE: A UC Davis graduate student has started a petition at Change.org to ask the California State Auditor and Commission on Judicial Performance to investigate Judge Sharon Lueras for misconduct in connection with the deaths of Ryder Salmen and Matthew Hernandez. To view the petition, click here. Jessica Rose Hernandez contends that Sacramento Family Court Judge Sharon A. Lueras is responsible for the Feb. 26 hatchet death of her 9-year-old son Matthew by ex-husband Phillip Hernandez, according to media accounts. Jessica went to court last November to request custody of her two children. At a court hearing before Judge Lueras, the mother of two attempted to introduce evidence, including text messages, to support her assertion that her ex-husband was back on drugs, acting irrationally, and posed a threat to their children. Judge Sharon Lueras refused to consider the evidence, and denied the custody change request, according to news reports. 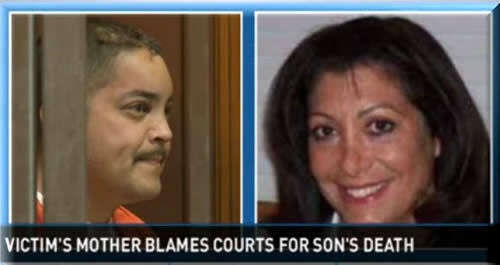 “I blame her for Matthew’s death,” Jessica told News10. Jessica Hernandez did not have an attorney and represented herself in court. Sacramento Family Court watchdogs have long asserted that the court operates a two-track system of justice where members of the Sacramento County Bar Association Family Law Section and their clients receive preferential treatment from judges, court employees and at court hearings, while indigent, unrepresented litigants are treated as second-class citizens and often prohibited from exercising basic rights, such as introducing or objecting to evidence. Roughly 70 percent of family court users do not have a lawyer, according to state statistics.